Apple’s March 25th event was all about services and content. Following the previous week’s hardware announcements (including a new iPad Mini, AirPods, and more), Tim Cook took the stage at the Steve Jobs theatre to share Apple’s new and extended services – and simultaneously give us a look at how Apple as a company is likely to evolve. 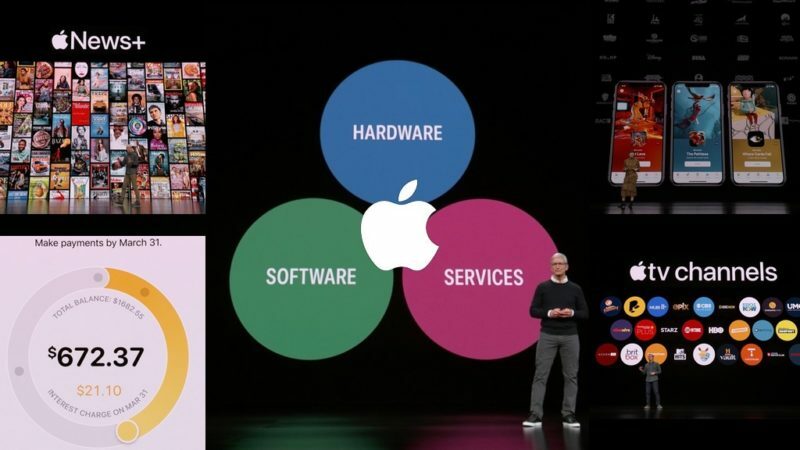 Before we dive in, it’s worth noting a much-repeated part of the presentation that outlines what Apple delivers with each of these services. Playing to Apple’s strengths, these are: ease of use; attention to detail; privacy & security; expert curation; personalization; and family sharing (extra yay on that one – see more below). Well, if there was going to be anything that seemed a shoe-in to be announced at this event, it was the long-rumoured Apple original video content. However, there was quite a bit more on offer as well, much of it tying around an update to Apple’s TV app coming this May (which will expand the geographic availability of the TV app from 10 countries to more than one hundred). Apple’s (confusingly-named) TV app has been redesigned to bring together movies, TV shows, sports, and videos for kids in an updated interface that also allows for several other parts of this announcement to be fulfilled. 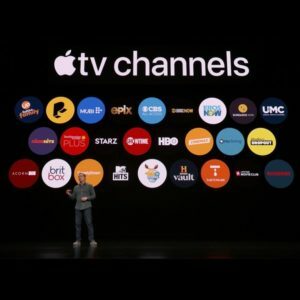 Seeming like a toned-down version of the long-rumoured cable subscription service, the app will include a subscribe-by-channel approach embraced through the new Apple TV Channels (including HBO, Showtime, Starz, and lots more), but also integrating cable and related content (e.g. Spectrum, DirecTV, Optimum, Hulu, PlayStation Vue, and Fubo). The new TV app gathers content from all of those sources (plus existing sources, including iTunes) and includes new ways to browse content, sign up for channels (a simple, one-step approach), and more. Mercifully, this means no more of the (current experience of) bouncing in and out of apps to view content you find through the TV app. Further to this (since it wouldn’t be possible otherwise), the TV app will be coming to the Mac this fall, meaning that you can watch all of this on your desktop or laptop as well. But probably the biggest news is that Apple’s TV app will also be made available through smart TVs (starting with Samsung this spring, and expanding to include Sony, LG, and Vizio) plus Amazon’s FireTV and Roku. This aligns pretty well with the (very surprising at the time) previous announcement that Apple Music will be available on a variety of non-Apple devices, and certainly shows Apple knocking down part of its walled garden (which is great news) to pursue a broader base of subscribers. 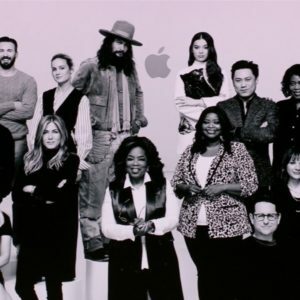 I’m not going to go into the new Apple content here – it looks interesting (and shows the potential of Apple in this area given they can get Steven Spielberg, Oprah, and other heavyweights presenting their shows as part of an announcement like this) but the competition is pretty fierce here and content is a long game. In a nutshell, Steve Spielberg will revive the Amazing Stories concept in a serial; Jennifer Aniston, Reese Witherspoon, and Steve Carrell will all star in The Morning Show comedy/drama series; Oprah will have some new documentaries (and talked about doing book clubs through Apple but without much detail on that); and more (including Little America, based on stories of immigrants, and a new preschool show with Sesame Street called Helpsters). Games are the most popular category in the App Store but, with more than 300,000 games and users’ tendency to pass up paid gaming for free apps, there are some amazing titles that never get the chance to reach a large audience (e.g. because of what they’d have to charge to cover development costs for a very high end game). Apple’s solution to this is a new subscription service (built into the App Store for discovery purposes) called Apple Arcade. An Apple Arcade subscription will let you play any of (currently) 100+ new games exclusive to Apple and curated by its team of experts. Not only can these games all be played on the Apple TV, iPhone, or iPad, you’ll also be able to pick up wherever you left off from one device to another. There will be no ads or additional purchases allowed, and all games can be downloaded to be played without an internet connection. 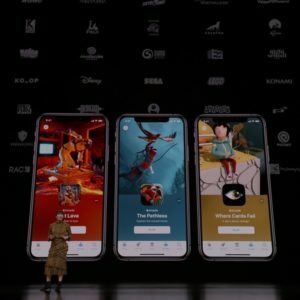 In a great addition that Apple seems to be embracing with its other services, Apple Arcade will be available to your entire family through Family Sharing. Apple Arcade will be available this Fall in more than 150 countries, with pricing and other details to come. Probably the most interesting service area to see Apple moving so strongly into is payments. With Apple Pay to pass ten billion transactions in more than 40 countries in 2019, it’s not only been a success for traditional retail, it’s evolved into applications like being accepted as a source of transit payments in London, Moscow, Tokyo, and several Chinese cities, and expanding to Portland, Chicago, and NYC later this year. Basically Apple wants to take all it’s learned from Apple Pay – and its focus on simplicity, transparency, and privacy – and extend it to its own (virtual and physical) credit card. Lots of reasons for this on all sides but I think quite good for users (not just good for Apple). So what does that mean? Well, how about no late, annual, international, or over-limit fees as a starter. For rewards, you’ll get 3% daily cash back on purchases directly from Apple, 2% daily cash back on anything you pay for with Apple Pay virtually, and 1% daily cash back on purchases using the physical card (which, in true Apple style is laser-etched titanium with no card number, CVV, expiration date, or signature on it – though you can get that info from your Wallet app easily enough). Just as Apple has made a brilliant positioning move out of caring about your physical health (through the Apple Watch, Healthkit, etc. ), they’re doubling down on this approach by trying to help Apple Card users stay financially healthy. This includes a variety of ways to track and organize expenses (e.g. machine learning to clearly identify the stores/companies from which each purchase was made; purchase categories; weekly/monthly summaries), as well as making it much easier to assess the costs incurred by different payment options (e.g. 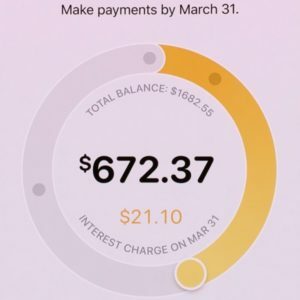 calculating interest on balances and similar things that most credit card companies try to hide from you) and scheduling more frequent payments plus other helpful features. You’ll be able to sign up for the card on your iPhone and start using it right away. Apple Card is accepted anywhere Apply Pay is accepted and can be used across all Apple Devices (it basically lives in the Wallet app). The new Apple Card (which uses Goldman Sachs as its issuing bank and Mastercard’s global payment network) will be available in the US this summer (not sure how fast I’d expect that to move to other countries given all the hurdles Apple must’ve gone through to pull this off). While Apple News hasn’t really exploded into the cultural consciousness, it does serve up five billion articles each month and is a solid news app with some great human curation and machine personalization features. 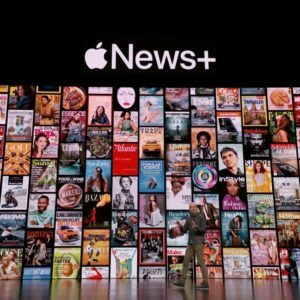 Now Apple wants to make it easier to access even more content and Apple News+ does that by adding more than 300 magazines plus premium digital content and a few newspapers into the mix (the LA Times and Wall Street Journal to begin with) into a new tab in the Apple News app. Magazines have customized designs for iPad and iPhone, including “live covers” (basically video background on magazine covers) and some other nice features (automatic downloads, offline reading, etc.). Due to essentially being subscribed to ALL the titles in Apple News+, the service also makes discovery easier by surfacing specific articles from different magazines according to your tastes. A subscription to Apple News+ will cost $9.99 (USD) per month (which is shareable through Family Sharing, which is a very compelling addition) and is available now with a software update. Its launch in the US and – to my great surprise and pleasure – Canada (in English and French, and which adds more than 30 Canadian magazines plus The Star newspaper), and will expand later this fall to Australia and the UK. What’s your favourite announcement? Let us know on Amber’s or commandN’s social channels!